The opportunity for chaos always stirs college football fans. And it looked like we were in store for some this year. Six top-flight SEC teams emerged early. Oregon, Kansas State, Notre Dame, Louisville and Florida State looked every bit the flag bearer for their conferences. Chaos was certainly coming. Then it arrived in November in the form of unbeaten Alabama, Oregon and Kansas State suffering surprising first losses. But then all was quiet. And when all was said and done in the 2012 college football season, it was pretty clear. Notre Dame, on the strength on an undefeated season, and Alabama, winners of the battle-testing SEC, will finish 1-2 in the final BCS standings and meet for the BCS title at the end of the expansive bowl season. Championship weekend served as a clarifying moment for many of the thing college football fans thought we knew, but couldn’t guarantee. Alabama, Florida State, Stanford, Louisville, Wisconsin and Kansas State secured BCS bids in traditional fashion. Florida, tomorrow’s No. 3 team will claim a bid as the top-ranked member of a AQ conference to not actually win that conference. Oregon, set to land at No. 5 with one overtime loss to Rose Bowl-bound Stanford, will almost certainly be snatched up by a BCS bowl right away. That’s nine. Then that 10th and final bid. Coming into the weekend it was all about the non-AQ and the chance at a BCS buster. But the hope will stop here. Not enough happened for the MAC champion Northern Illinois or MWC champion Boise State to make a BCS bowl bid. And so, for a second straight year, we will forgo the non-AQ storyline taker and have a set of BCS bowls with 10 AQ conference members. The best shot the non-AQs had at a BCS bowl was Northern Illinois. And the Huskies will just miss out at No. 17. That’s the long and short of it. We’ll be here to take you through the entire process tomorrow — human polls, computer rankings, bowl pairings and BCS rankings Follow along @BCSKnowHow and right here to stay up to the second with projections, mathematical breakdowns of the computers, human polls and everything in between. We’ll put up a chat room for questions and general discussion, too. Alabama claimed the BCS national title, but was not a unanimous choice among the components of BCS system and the AP poll. To see just how the bevy of season’s end rankings played out, we’ve set out to simulate a set of BCS rankings, using the AP poll in place of the Harris poll. What we get is a good aggregate of all of the final rankings, and the equivalent of a year-end, final BCS rankings. We also used the six BCS computers, not all of which declared Alabama as the top team in the nation. In fact, both Oklahoma State and LSU claimed the top spot in one computer ranking. Mostly, this is just for fun, a good look at what the BCS standings would look like if they were released after the end of the season. The formula is exactly the same as the BCS utilizes during the regular season, except the AP poll is subbed in for the Harris Interactive Poll, which does not release a post-season edition. Unsurprisingly, Alabama leads the way, despite its non-unanimous support. LSU and Oklahoma State finish in their expected No. 2 and No. 3 spots, respectively. Arkansas and Oregon see the completion of strong regular seasons and impressive bowl victories to both finish in the top five. A little further down, we get a surprising sixth-place finish from South Carolina, who are chased closely by Boise State, where the Broncos finish just .0003 behind the Gamecocks. For fun, we placed USC in the mix, as they are named in all six computers and in the AP. We just replicated the portion the No. 9 Trojans got in the AP for the Coaches’ and used the computers as per usual. Other surprises include No. 10 Baylor, who completes a fantastic season led by Heisman-winning quarterback Robert Griffin III and the non-AQ No. 16 Houston and No. 17 TCU, both of which had shots at BCS bowl bids but were shut out on the last weekend — a Houston loss and TCU finishing outside of the top-16. Fourteen weeks, and there seems no quelling of the debate and uproar about who deserves what in the college football landscape. That being said, however, the 2011 regular season is complete, and now our attention must turn to the BCS standings and bowls to be announced tomorrow. The thing that is causing the most debate, of course, is the possible rematch awaiting the country in the BCS title game. And for those who are against it, do be prepared to weather the storm of the rematch, but a swaying of opinion has occurred, and for what it’s worth, Oklahoma State should be on its way to the BCS title game. Alabama will just miss out on its chance at a rematch, finishing at No. 3, with Stanford just behind the Cowboys at No. 4. So. Why? It comes down to persuasion. Virginia Tech needs to be replaced on ballots. Oklahoma State whipped Oklahoma up and down the field. Houston is no longer a factor. Boise State can be forgotten. Oklahoma State stands as the team most of the country (save the Alabama faithful) wants to see get a chance. The pollsters can make up the difference. And I believe they will. There’s no need for Oklahoma State to leap Alabama. They just need to be very close. And they will be. Oklahoma State can make up some distance in the computers. Of course, this is a simple projection, and nothing about it is absolute. There are, however, other components which are more absolute when the BCS pairings are announced tomorrow. Oregon, as champion of the Pac-12, is headed to the Rose Bowl to face Wisconsin, the Big Ten’s conference champion. Clemson is on its way to the Orange Bowl as the ACC champion, as the ACC is bound to the bowl unless the ACC champ is playing in the national title game. West Virginia will likely be the recipient of the Big East’s BCS bowl bid. After sharing the regular season crown in the conference with Cincinnati and Louisville, the Mountaineers will assuredly win the tiebreaker for the conference’s bid by finishing highest among the three teams in the final BCS rankings. TCU, if it can finish ahead of the highest ranking Big East team and ahead of Southern Miss, which is likely, and vault into the top 16 will receive a BCS bowl bid as the highest-ranking non-AQ conference champion that ranks ahead of a AQ conference champion in the top 16. Oklahoma State will be assured of a BCS bid. But will it be in the title game? If these projections hold up, it will be. Stanford at No. 4, will not be afforded an automatic bid to the BCS as it was last season at No. 4, but will likely be a very eligible team for any BCS bowl to select. Boise State, Kansas State, Michigan, Houston and Oklahoma will all also likely be eligible come tomorrow. Who will take those remaining slots? Michigan is likely to cross the top 14 threshold to get into the BCS, but TCU is likely to miss out. 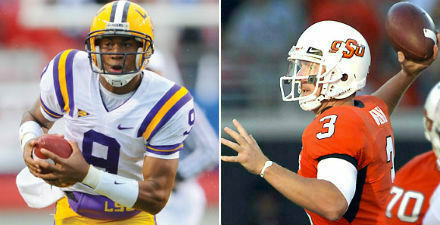 Check out our BCS Bowl projections here. That’s the bowl picture — it’s messy at best — but the BCS standings shouldn’t be so difficult to digest when they’re released tomorrow. Remember, we’ll be here to take you through all of it, starting with tomorrow’s releases of the human polls, computer rankings and BCS. Follow along all day tomorrow @BCSKnowHow and right here to stay up to the second with projections, mathematical breakdowns of all of the computers, human polls and everything in between. Then follow along this week as we break down scenarios and implications. Every year, we here at BCS Know How publish postseason BCS rankings, what the BCS would look like if it were to come out after the conclusion of all of the bowl games. All we try to do is to look at what the BCS would think of the teams after all is said and done. Thankfully, most of the components of the BCS feel the same way – that postseason rankings are appropriate, we just compile those statistics into a new BCS ranking. After Anderson and Hester finally released their postseason rankings yesterday, we can finally reveal the top 12 in the BCS Know How Postseason BCS Rankings. For the formula, we replace the Harris Interactive Poll with the Associated Press as the Harris does not reveal postseason rankings. 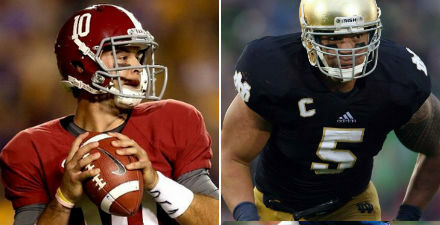 Not surprisingly, the BCS National Champion Alabama Crimson Tide claimed a unanimous No. 1 vote throughout the BCS components. Florida comes in close behind, reaffirming the belief that the SEC held the two best teams in the nation this year. BCS darling Boise State and BCS runners-up Texas are a close No. 3 and 4, while No. 5 Rose Bowl champion Ohio State is well off the pace. TCU, Iowa and Cincinnati round out the top eight, all bunched closely together. The Bearcats and Horned Frogs had been third and fourth in the final BCS rankings, but losses in BCS bowls hurt their cases at better final rankings positioning. If you want to take a closer look at all of the final rankings, you can take a look at BCS Know How’s Postseason Rankings worksheet right HERE. An entire season passed us by we waited for an upset, some kind of drama. Finally we got a dramatic weekend, and an upset of the No. 1 team in the nation in the final weekend of the season, and the BCS bowls were finally announced after weeks of prognostication. After upsetting the Florida Gators in the SEC Championship Game, the Alabama Crimson Tide secured a berth in the BCS National Title game, where they will meet the Texas Longhorns. The Longhorns needed a last-second field goal to clinch the Big 12 title and spot in the National Title game. The two teams finish a convincing 1-2 in the final BCS rankings, with Cincinnati finishing third, but outside of striking distance. The rest of the BCS bowl bids were filled rather predictably, in fact the ten teams that received BCS bowl bids were the teams that finished 1-10 in the final BCS rankings. Falling to No. 5 after their loss in the SEC Championship Game, the Florida Gators were rewarded for an undefeated regular season with a Sugar Bowl bid where they will meet those Bearcats. No. 4 TCU and No. 6 Boise State will meet in the Fiesta Bowl, a first for the non-BCS conferences – not only to play each other in a BCS bowl game – but also the first time ever that more than one non-BCS school was invited to the BCS party. No. 7 Oregon and No. 8 Ohio State have known their fates for quite some time, and when the BCS rankings were released, it mattered little where they finished – the Rose Bowl will likely provide one of the best matchups of the bowl season. No. 9 Georgia Tech will find themselves rewarded for their ACC Championship with a matchup with Big 10 resurgent Iowa, who finish tenth in the final BCS standings. So the regular season is done, and now we enter what ESPN calls the most wonderful time of the year. Stay tuned to BCS Know How as we will provide previews and analysis in the coming days for all the bowl games. We waiting weeks for this weekend to come, hoping that it would deliver the drama and intrigue that the rest of the season was missing, and it did not dissapoint. Texas, playing in what was supposed to be a cakewalk of a Big 12 Championship Game instead needed instant replay on the clock and a 46-yard field goal that just sneaked in the uprights to clinch victory and a likely shot at the national title game. Alabama and Florida were supposed to play in the season’s most intriguing game. Instead what we got was an Alabama romp, blowing out the Gators and likely clinching their shot at the national title. So it’s likely that we’ll get that SEC Champ vs. Texas game when the last BCS standings are released tomorrow. But it could have been much different. If Texas had lost, we would have entered one of the messiest final BCS rankings in the system’s history, but we avoided that by the slimmest of margins. We know that Oregon and Ohio State will make the Rose Bowl game and continue the Big Ten vs. Pac-10 rivalry. We know that Cincinnati will receive a BCS bowl bid, we just don’t know from where. We know that Georgia Tech is going to get a bid to the Orange Bowl with their victory over Clemson in the ACC Championship Game, as the bowl and the conference have ties that allow for the conference champion to receive an automatic bid there. We are almost 100% sure that Alabama and Texas will meet for the national title game after winning every game they needed to in order to get to the biggest game of the season. We can also be pretty sure that Florida will receive a Sugar Bowl bid despite losing the SEC Championship Game, as the Sugar Bowl will likely want an SEC team despite the SEC Champ going to the National Title Game. Another thing that’s guaranteed: TCU will get a BCS bowl bid due to the BCS’s automatic bid qualifying policy for non-BCS schools. So the six BCS conference bid are set, and two at-large bids are also nearly set in stone. That leaves two openings. Iowa, Penn State, Boise State, Virginia Tech, LSU and BYU will all likely be eligible tomorrow. It seems like the Big Ten teams that trail behind Ohio State; Iowa and Penn State, will be one of the at-large selections. The other selection cannot be a Big Ten team, but could be any of the other teams mentioned. If logic holds up, Boise State would receive that bid, and we at BCS Know How project that they will in fact get that final bid.